Published: March 20, 2019 at 10:01 a.m.
Free agency is a time of transition in the NFL. Every player saying hello to a new team has to say goodbye to an old team. Which departures this spring -- either via free agency or trade -- will hurt the most in 2019? I've ranked 10 below. LEFT: Baltimore Ravens. FOR: New York Jets. Rather than use the franchise tag on Mosley, the Ravens gambled that they could negotiate a deal to keep him in town. In the end, Baltimore broke dubious new ground, as Mosley's departure for the Jets marked the first time the franchise failed to keep a first-round pick who made three or more Pro Bowls beyond his rookie deal. 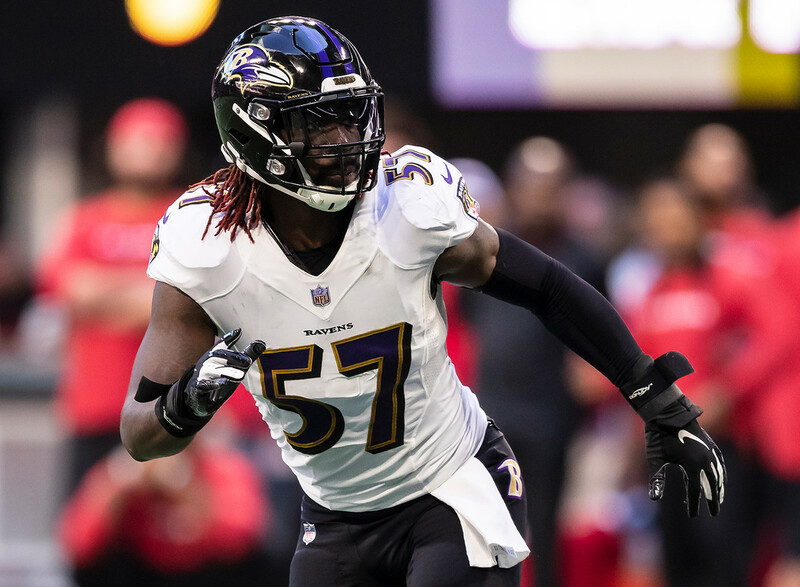 His exit also leaves a gaping void in the middle of the Ravens' defense, which ranked first overall last season and second in points allowed. Mosley was the catalyst of that unit, which is why he ranks above fellow defensive defections Za'Darius Smith and Terrell Suggs -- just think of Mosley's clutch, drive-killing pick of Baker Mayfield in the regular-season finale. TRADED FROM: New York Giants. TO: Cleveland Browns. The recently signed Golden Tate is a quality receiver, but it's unfair to compare him to Beckham, who has more receiving yards (5,476) and receiving touchdowns (44) -- by far -- than anyone else to have played in less than 60 career games. Yes, Saquon Barkley is still on the roster. But with Beckham gone, New York no longer has a receiver capable of dictating the defensive coverage or scoring from anywhere on the field. It's hard to figure out what the Giants are trying to do, though it obviously would not be shocking to see them draft a receiver this year, especially now that they have the Browns' first-rounder (No. 17 overall) in addition to the sixth overall pick. Knowing general manager Dave Gettleman, I think he'll try to trade down for more picks if he can. I will say, as someone who thought this team had a shot to go from worst to first in 2019, the Beckham trade surprised me. TRADED FROM: Pittsburgh Steelers. TO: Oakland Raiders. Say what you will about Brown's unprofessional behavior in Week 17, but it will be DIFFICULT to replace the production of arguably the NFL's top wide receiver. From 2013 to '18, no one came close to matching Brown's totals in yardage (9,145), receptions (686) or receiving touchdowns (67). Losing Le'Veon Bell will hurt, too, but at least James Conner has already shown he can succeed in Bell's place. Brown's targets (he had a league-high 1,026 over the past six seasons, and 168, third in the NFL, in 2018) will be split among JuJu Smith-Schuster, Donte Moncrief, James Washington and Eli Rogers. You have to think much of his production was linked to the attention opponents paid to Brown. Will Washington, Moncrief or Rogers be able to keep defenses from double-covering Smith-Schuster? LEFT: Philadelphia Eagles. FOR: Jacksonville Jaguars. If everything goes according to plan, Foles' absence won't impact Philadelphia at all. But it's impossible to ignore the fact that Foles rescued the Eagles after injuries to franchise QB Carson Wentz in each of the past two seasons, winning them a Super Bowl in 2017. It's not a surprise that Foles is gone, given the financial impracticality of trying to retain a starting-caliber backup for more than a season or two. But the reality is, if Wentz misses time again in 2019, the Eagles will now have to hand the reins to untested second-stringer Nate Sudfeld. People inside the organization think Sudfeld is pretty good, and he looks the part, as a big, tall guy who can throw hard, but he's also attempted just 25 NFL passes in his life. Losing Foles means losing a rock-solid insurance policy for a team trying to make the most of its current competitive window. LEFT: New England Patriots. FOR: Oakland Raiders. Yes, when it comes to personnel departures, Patriots coach Bill Belichick has a long demonstrated history of knowing what he's doing. Look no further than the man who cleared the way for Brown last season. After Nate Solder signed a four-year, $62 million deal with the Giants, New England traded for Brown, who stepped into the left tackle spot and allowed just three sacks, tied for ninth-least among players with a minimum of 500 pass-blocking snaps, according to Pro Football Focus. That said, there is nothing like a sure thing currently in line to replace Brown. The front-runner looks like Isaiah Wynn, a first-round pick in 2018 who has yet to play an NFL snap, thanks to a torn Achilles suffered in the preseason last year. But Wynn is on the smaller size for the position, and the team could again turn to the draft here. LEFT: Baltimore Ravens. FOR: Arizona Cardinals. Suggs is not the same caliber of player he was in his prime. But even at 36 years old, the NFL's active career sacks leader (132.5) leaves Baltimore as a productive pass rusher, having generated seven of the Ravens' 43 sacks last season. Suggs also provides an intensity and presence that will be difficult to replicate. With Za'Darius Smith also flying the coop for Green Bay, Baltimore will have to bet on Matt Judon to step up. I liked Judon coming out of school; the fourth-year pro and former fifth-round pick has the characteristics you want to see in a pass rusher, and the team must have some level of confidence in him. But he'll be trying to fill exceptionally big shoes. LEFT: Houston Texans. FOR: Kansas City Chiefs. Ultimately, the Texans might be proven prudent for bowing out of a bidding war with the Chiefs. After all, Houston has had a season to evaluate Mathieu first-hand. But if the Chiefs are right about Mathieu's value, the Texans will be missing out on a player with a special combination of coverage skills, playmaking ability and leadership qualities, the kind of presence that every successful secondary needs. With Kareem Jackson and Kevin Johnson also suiting up elsewhere in '19, and newcomers Tashaun Gipson, Bradley Roby and Briean Boddy-Calhoun coming to town, Houston will have to reestablish chemistry among the DBs, and that can take some time. The bottom line with Mathieu is that he's got IT -- a knack for recovering fumbles and knocking down passes, all conducted with a fiery competitiveness. LEFT: Miami Dolphins. FOR: Denver Broncos. Over the years, the Dolphins have continued to make the same mistakes, failing to extend many of their own draft picks and instead spending money and capital on outside veteran acquisitions who fail to fulfill expectations, like Ndamukong Suh, Mike Wallace and Robert Quinn. James now joins the ranks of former Miami draftees Olivier Vernon and Lamar Miller who have been allowed to leave for greener pastures -- and there's no obvious replacement waiting in the wings, though the Dolphins do hold the 13th overall pick. James, meanwhile, wasn't an elite blocker by any means, but he might become one working with outstanding offensive line coach Mike Munchak in Denver. LEFT: New York Jets. FOR: Seattle Seahawks. Few would have expected Myers to bounce back from his release by the Jaguars in 2017 to become a Pro Bowl kicker with the Jets, especially given how difficult it can be to kick in MetLife Stadium, where wind and inclement weather are rampant. And yet, he converted 33 of 36 field-goal attempts in 2018. I'd expect him to kick even better in the enclosed environment in Seattle. Meanwhile, allowing Myers to walk doesn’t make a lot of sense in a league where the margin of victory is often 3 points or less, especially when you consider the copious amounts of cap space the Jets still have. Recent signee Chandler Catanzaro hasn't attempted more than 15 field goals since 2017, when he converted 83.3 percent of attempt with the Jets. LEFT: Tampa Bay Buccaneers. FOR: Tennessee Titans. Humphries is an ascending slot receiver whose production has improved in each of his four NFL seasons, culminating in an 816-yard effort in 2018. He seemed like kind of an afterthought in Tampa Bay, overshadowed by Mike Evans, O.J. Howard and, of course, DeSean Jackson. But I think Humphries will bring a good combination of experience and upside to Tennessee. Justin Watson -- a fifth-round pick last year -- has the traits to succeed, including speed, but he's obviously less experienced than Humphries.